Isn’t it crazy that the older we get, the busier we get? You don’t understand how simple life really is in your youth. You wake up, eat, go to school, take some tests, talk to some friends, go to practice, eat dinner, do some chores and go to sleep, and do it all over again. Then you go to college, study, take some mid terms and finals, meet some friends, go to some parties and go to sleep. You have responsibilities, sure, but they are nothing like what an adult will face once working a 50+hour work week, getting married, having kids, owning and managing a home, doing your taxes, taking care of your family, trying to stay in shape, and dealing with real-life issues. 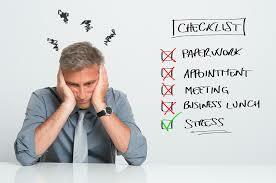 Health, faith, money, work/life balance, legal issues, divorce, vacations…all of these things equal stress. It can be very easy to get overwhelmed with life and everybody deals with it in different ways. The important thing is, don’t stress yourself out when things happen that are out of your control. Take it one step at a time and do your best to deal with what life throws you. Don’t be this guy – take matters into your own hands. Be in control. This entry was posted in Blog on September 3, 2016 by BronsonQuon.